Installing the NEST simulator for use with Anaconda was pretty painless. However, it took me two failed tries to realize just how painless, so I thought I'd post how I got it working. Note I am in Ubuntu 16/Python 3.7/Conda 4.5.11. If you are on Windows, don't even bother. Just install Linux. Note this is for the 'standard' configuration as described at http://www.nest-simulator.org/installation/. build in /opt/nest, so change your values below accordingly if you want something else. Note the -Dwith-python=3 option, which forces it to use Python 3. I got some warnings ('Cannot generate a safe linker search path for target sli_readline ') but things seemed to work out ok.
From your favorite IDE or command line, run a simple script (e.g., one_neuron.py in pynest/examples). The one_neuron.py example worked just fine. Note, though, if you are using spyder, you will not want to run your code using F5 unless you are a fan of restarting your Python kernel constantly. To avoid problems, I recommend entering run filename.py in Spyder's (ipython) command line when ready to run a script. There were lots of great articles the last couple of months, in particular a series of articles on the fly's representation of it's position in space that seem to be coming together nicely. Singla et al.. A cerebellum-like circuit in the auditory system cancels responses to self-generated sounds -- Nature Neuroscience [Pubmed] It is well-known that the brain is able to factor out which sensory inputs are generated by an animal's own behavior, and which are generated by events in the world. How brains do this is still an extremely active research are. In this paper, the authors report a class of cells in the dorsal cochlear nucleus (DCN) of the brain stem that respond robustly to externally generated auditory cues, but not to self-generated auditory cues in mice (in particular, the sounds generated when they lick). Amazingly, when researchers artificially pipe in sounds in response to licking behavior, these DCN neurons eventually supress responses to such sounds, as if the brain were starting to treat them as being generated by the animal. The authors seem to have found a beautiful model for sensory cancellation effects, one that is very much like that seen in the mormyrid electric fish (as discussed by Abbott's group recently here). It will be interesting to see how similar the principles are in these different systems as folks dig under the hood. Green et al.. A neural circuit architecture for angular integration in Drosophila -- Nature [Pubmed]. This is actually one of three that papers came out recently, building on a landmark paper from 2015, showing that the fruit fly contains a circular structure (the ellipsoid body, or EB), that acts as an internal compass, and contains a set of neurons that lights up at a different position on the ellipse depending on the angular position of the fly in space. In this paper, they test a potential circuit mechanism about how such an internal compass might be implemented. Namely, there is a second structure, the protocerebral bridge (PB), that is reciprocally connected to the compass, but slightly shifted around the circular axis, and which is preferentially activated by turning behavior. So, for instanced, when the fly turns right, the PB neurons (labeled P-EN in the video) will project to the compass neurons (labeled E-PG in the video), but to a region just a little bit ahead of the presently active spot on the EB. Excitatory interactions will drag the spot around to the appropriate location. This paper is nice because they have tests of sufficiency (activating PB glomeruli causes a shift in the compass location), and necessity (inactivating PB disrupts the compass). There is a lot more to the paper: the anatomy actually gets fairly complicated, and I have purposely suppressed tons of details and nomenclature (e.g., if you start to get lost in the anatomy, see this paper, or this one). So far, many of the fly-compass researchers seem to be doing relatively coarse-grained calcium imaging (e.g., this glomerulus lights up, and that one doesn't). The work is excellent, as they are pulling information from particular cell types to extract specific hypotheses about circuit mechanisms. Ultimately, though, you still end up with black-boxology (though with fine-grained boxes). The real power will come when they start triangulating their ridiculously powerful genetic toolkit with finger-grained electrophysiology and anatomy to really crack the circuits mechanisms at single-cell resolution. My guess is this is their aim. One question I have after reading this and other papers is what is the point of this compass? It seems to not effect the animal very much if you perturb it using optogenetics (see Turner-Evans paper below). In this paper they talk about "occasional" changes in behavior when they disrupt things by stimulating PB, but don't explore or quantify this effect. I am not sure what happens, to spatial navigation, if you ablate EB. Is it like the hippocampus, in that it is more involved in memory than online spatial navigation, even though there is a beautiful spatial representation contained there? Turner-Evans et al.. Angular velocity integration in a fly heading circuit -- Elife [Pubmed]. Testing the same phase-dragging model as Green et al., with similar results and some nice patch-clamp data from PB. Video is from this paper. 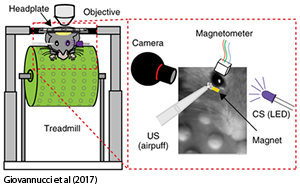 Kim et al.. Ring attractor dynamics in the Drosophila central brain -- Science [Pubmed] Looking at the compass in animals in flight, instead of just on the floating ball. Park et al.. Moving slowly is hard for humans: limitations of dynamic primitives -- J. Neurophysiology [Pubmed]. While you will often hear of the speed-accuracy tradeoff (that is, the faster you try to do something, the more likely you are to make a mistake), does this mean when you move really slowly you get really accurate? People don't' typically study the lower extremes of the speed-accuracy tradeoff. In this study they did just that. They had human subjects move their hands back and forth at different speeds, sometimes extremely slowly, so slowly that they could no longer maintain a smooth oscillatory behavior, but started to halt and stop and start again, as if they were shifting from a continuous to a discrete behavioral strategy. While this paper doesn't have any neuronal data, it is significant and fun because of its attempt to infer underlying mechanisms of motor control strategies from a clever and creative extension of simple behavioral techniques. A colleague of mine pointed out that it would be interesting to see how much improvement we would see with training on this task. My reaction is that, even if subjects could ultimately move smoothly with 500 hours of training (dear God please don't do that to your poor undergrads), it would still be significant if without such training, we naturally switched from a continuous to an intermittent control strategy in low-velocity regimes. I had a grant and paper submission in the last month, so my summary had to take the back seat: I will be combining the June and July literature summaries..Lots of good stuff! It was a great month for systems neuroscience, and the following articles stood out as pushing things forward in unexpected (to me) and interesting ways. Tien et al -- Homeostatic Plasticity Shapes Cell-Type-Specific Wiring in the Retina -- Neuron [Pubmed] This is an amazing paper. They generated a line of mice that was lacking a certain type of retinal bipolar cell (the B6 cell). 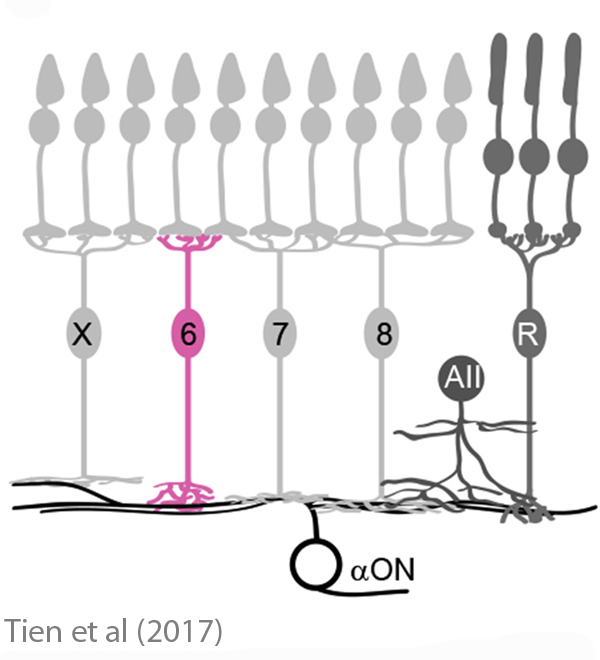 The B6 cell is typically the main input to the ONα retinal ganglion cell. Instead of being completely wrecked in this line of mice, the ONα RGCs actually maintained the same response profiles seen in wild type animals. This was because other types of bipolar cells compensated for the loss of the B6 cell in the circuit. Hence, it seems that compensatory plasticity mechanisms at play in the retina served to rewire the inputs to this class of RGC to maintain the same type of output to the brain. I always thought homeostatic plasticity research was very cool, but more about neurons maintaining firing rates by changing concentrations/distributions of ion channels and other relatively vanilla properties confined to single units. 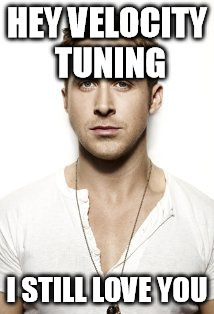 If there are homeostatic mechanisms at play in systems, with homeostatic sculpting at the circuit level? This seems to be taking things in an entirely new direction. The authors looked at calcium dynamics in neurons across supragranular layers of cortex as mice learned a motor task (a simple lever-pressing task). 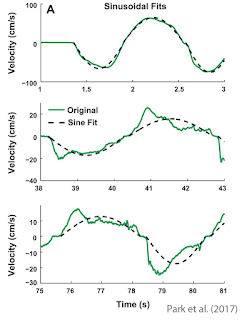 The sequence of activation among different motor areas became more compressed in time as they learned the task, and response variability decreased as well. 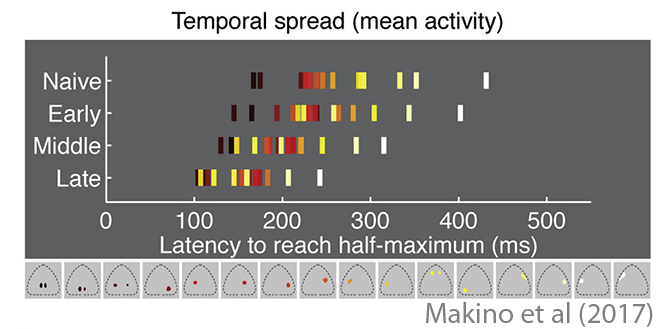 Interestingly, area M2, an infrequently studied motor region in rodents, became a key hub in the motor control network once animals learned the task: the movement-predicting signal in M2 started earlier as they learned, better predicted the activity of other motor areas, and inactivating M2 significantly impaired performance in the task. The reason I like this paper is that it isn't just another "Look at all the calcium imaging we did!" paper. It has substantive new results that seems to push our picture of motor control in cool new directions. Also, it is an interesting complement to the recent result from Kawai et al (from Ölveczky's lab) showing that performing a simple overlearned motor sequence does not require M1/M2 (Motor cortex is required for learning but not for executing a motor skill). While Makino et al do not discuss the Kawai paper, it would be interesting to hear their thoughts on it. Update added 6/7/17: I got a helpful comment from an author of the Makino et al. paper who pointed out that in Kawai et al, they didn't just remove M1, but M1 and M2. I missed this in my first reading of Kawai et al, and updated the present post accordingly. Further, he suggested that the task in the current paper requires finer-grained control of the fingers, while Kawai's task used more coarse-grained forelimb movement that are likely controlled subcortically. It is fairly well-known that dexterous digit control in rodents requires the cortex, as acknowledged by Kawai et al.. Finally, these are issues we will be hearing more about from Komiyama's group, so stay tuned! Lots of great systems neuroscience this month. It was hard to narrow it down, but three papers really stood out. Eichenbaum -- The role of the hippocampus in navigation is memory. J. Neurophys.. [Pubmed] Most of us have wondered about the relationship between the two main views of the hippocampus: on one hand, the hippocampus is key for long-term memory formation, and on the other hand we have the view from the place field, where the hippocampus contains a map that is used for navigation. In this wide-ranging review article, Eichenbaum forcefully argues that the hippocampus is not specialized for spatial navigation per se, but for the construction of memories of relatively highly organized complex information in space and time (i.e., episodic memories). He argues that context-dependent spatial features are just one of many complex relational features to which the hippocampus is sensitive as it serves its role in memory function. This review article is notable partly because it is a rich source of references that outsiders probably don't know about. For instance, if you are really familiar with an environment, you can still navigate it even with hippocampal lesions (https://www.ncbi.nlm.nih.gov/pubmed/15723062). Also, an imaging study in humans suggests there may be a grid-like parcellation of abstract conceptual spaces, not just geometric space (https://www.ncbi.nlm.nih.gov/pubmed/27313047). Note I can't endorse all these studies, as I have yet to read or evaluate them; but it is useful to have all this intriguing stuff in one place as food for thought. Giovannucci et al -- Cerebellar granule cells acquire a widespread predictive feedback signal during motor learning. Nat. Neurosci.. [Pubmed] Using calcium imaging, they recorded from populations of granule cells, the input cells of the cerebellum, during eyeblink conditioning (recall in eyeblink conditioning you associate a cue, such as a light, with an air puff to the eye, and eventually that cue will evoke a blink). As animals acquired the behavioral response to the new cue, this was reflected in the emergence of signals within the granule cells that predicted oncoming eyeblinks. What is really amazing in this study is that they recorded from populations of some of the smallest cells in the brain for multiple days in a row, in awake animals. I'm not surprised that the cerebellum acquired eyeblink-related control signals during training; what is most impressive to me is the raw experimental expertise involved here, and the potential this model system has for helping us dissect forward model theories of motor control. Shadmehr -- Distinct neural circuits for control of movement vs. holding still. J. Neurophys.. [Pubmed] A fun review article by Shadmehr that focuses on the eye movement system. There are different mechanisms at play for movement versus holding still, even though from the perspective of the muscles in your eyes, holding still is "just as much an active process as movement" (Shadmehr, quoting Robinson, 1970). Could this be a general principle? After reviewing the evidence from the eye-movement system in some detail, Shadmehr discusses whether the same principles might hold for neuronal control of head movement, arm movement, and navigation. This intriguing possibility could help shed light on apparent discrepancies between pre-movement preparatory activity observed in M1 (when animals are still) and activity observed during movement. This topic has received a lot of attention lately from Mark Churchland's lab (see , ). First post of monthly highlights from the systems neuroscience literature. My goal is to point out cool stuff that people might not ordinarily see, so I will try not to just include Nature and Science papers. I will typically highlight three to five papers a month, but this includes some February spillover so is a little longer. I will post by the fifth of each month. Shi et al -- Retinal origin of direction selectivity in the superior colliculus. 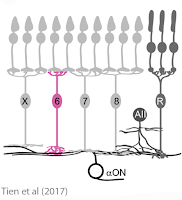 Nature Neuroscience [Pubmed] The authors used optogenetic stimulation to show that the motion-selectivity of superficial superior colliculus neurons is inherited entirely from the direction selectivity of retinal ganglion cells that project there. Yackle et al -- Breathing Control Center Neurons That Promote Arousal in Mice. Science. [Pubmed] The CPG that controls breathing contains a small subpopulation of neurons that projects to the locus coeruleus, which releases noradrenaline (i.e., sympathetic activation for fight/flight). Removing this subset of neurons apparently did not influence the ability of mice to breath, but did make them especially chill. Take-home lesson: if you want to calm down, stop breathing. Shadmehr -- Learning to Predict and Control the Physics of Our Movements. J Neurosci. [Pubmed] Interestingly, this month there were quite a few papers related to the forward model framework in motor control (for a review, see Shadmehr and Krakaur's Error correction, sensory prediction, and adaptation in motor control (2010)). This paper from Shadmehr is an excellent summary of his many seminal contributions to this framework over the years. It focuses on his research on our ability to learn to manipulate objects with our hands, which involves quickly learning their unique dynamical signatures. Maeda et al -- Foot placement relies on state estimation during visually guided walking. J. Neurophys. [Pubmed] The second notable paper from the forward-model theoretic framework. How do we walk when we wear prismatic lenses that render visual feedback unreliable? This paper suggests that subjects learn to weight internally generated predictions more than the resulting noisy and unreliable visual feedback. Similar results have been seen before in reaching tasks (e.g., Körding and, Wolpert, 2004). However, this is a cool use of distorting lenses to demonstrate such effects during walking, which is typically thought to rely on mindless CPGs. Confais et al -- Nerve-Specific Input Modulation to Spinal Neurons during a Motor Task in the Monkey. J. Neurosci. [Pubmed] When we move, we activate our own sensory transducers. What keeps our sensory systems from getting overwhelmed by such self-generated sensory signals? 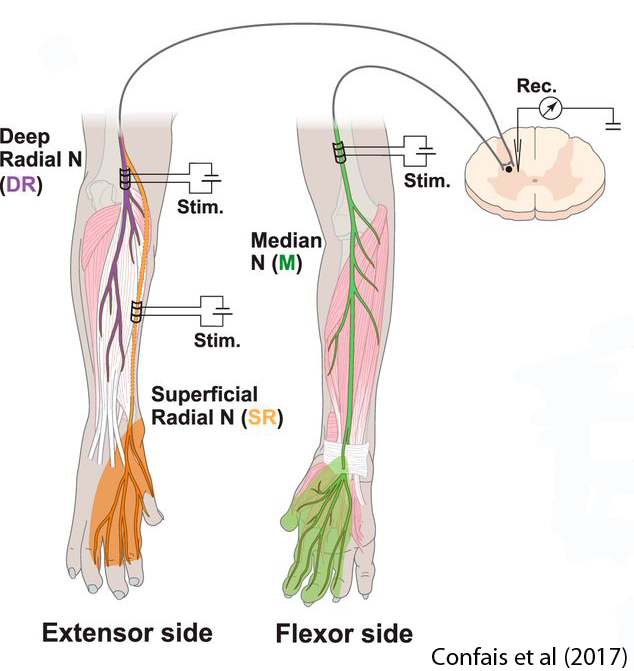 Following up on Seki et al (2004), this paper shows that there are sensory-nerve specific patterns of modulation (both excitation and inhibition) of somatosensory responses in the spinal cord during voluntary wrist movements. The sign of modulation sometimes depended on the particular direction of movement of the wrist. This is a beautiful model system for the study of the effects of corollary discharge. Chaisanguanthum et al -- Neural Representation and Causal Models in Motor Cortex. J. Neurosci. 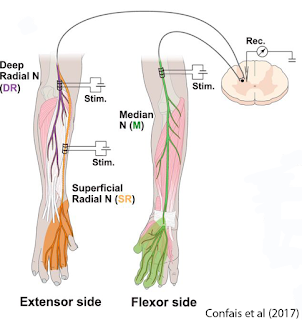 [Pubmed] An excellent paper straddling classical motor control theories of Georgopoulos and friends, and some modern ideas from a horde that has been attacking such ideas recently. 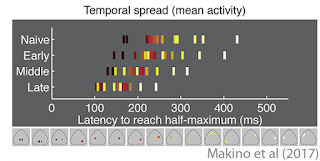 They construct a simple mathematical model of the sensorimotor transformation required to perform a center-out reaching task, and show that movement variability will be minimized when the output neurons that directly drive behavior are tuned to velocity. Indeed, they discover just such a population in their data (using a somewhat rough-hewn spike-width criterion to individuate subclasses of cortical neurons). While the model in this paper is simple, it is a welcome counterweight to the recent overreactions against Georgopoulos. Hopefully it is the first of many studies that will ultimately absorb previous work in a principled way. Why am I being so pro-Georgopoulos? I'm not: I'm just surprised that people have recently been so dismissive of Georgopoulos, to the point where it seems they are just attacking a straw man. 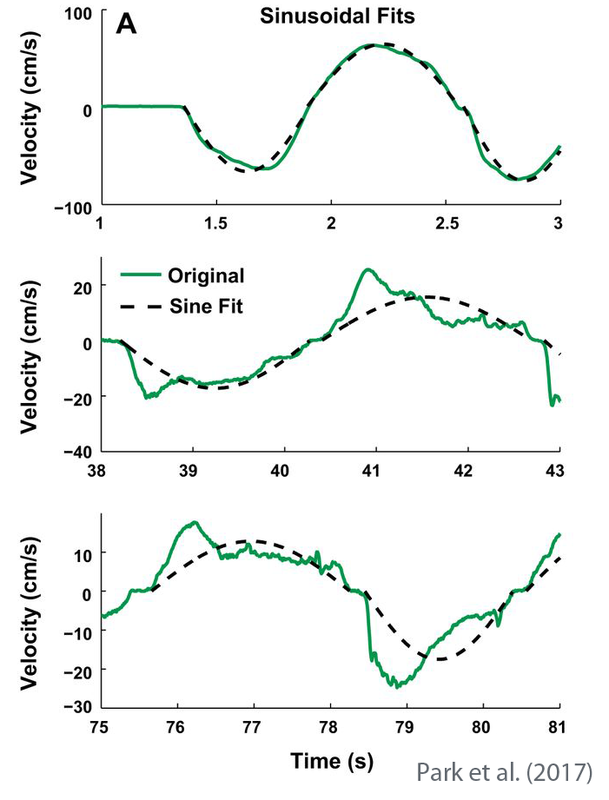 Students of motor control were never so locked into the velocity-tuning framework that they thought it would apply to all neurons (for an excellent review, see Kalaska, 2009). Further, is anyone that surprised at nonstationarities in the system? That is, was anyone really surprised that neurons don't show the same tuning properties seconds before an animal starts moving, when recording in brain regions whose primary function is to directly control movement? The sensory systems literature is absorbing nonstationarities and dynamics without all this fanfare. What's up, motor control?